She says, just like she does every day as I pull the heavy quilt to her shoulders; her little body so lonely in her big-girl bed. The room is dark; the blinds pulled shut against the winter sun. the scattered dishes from lunch and who knows how many other meals. Did I take meat out of the freezer? I am just so damn tired. I’m tired of making grocery lists and checklists, and still forgetting things. I’m tired of being late all the time and feeling not-good-enough. When the thing I actually need is right in front of me. She had already made room for me. So I slide beneath the blanket. Our noses touch and she laughs. The best sound I’ve heard all day. She throws her arm around my neck and presses her face to mine. I breathe her in and close my eyes; promising myself I won’t stay. Posted byPriscilla Putman February 24, 2016 February 24, 2016 Posted inUncategorizedLeave a comment on Stay, Mama. Art is a many splendored thing. True art can call up in us nostalgia or warmth or amusement or awe or a connection to God; a place of deeper thought. Art is not just for “artists”. It is for children and soccer moms and ballers and uncles and cat ladies and farmers and business men. Art is a painting. Art is a poem. Art is a sketch on a paper napkin. Art is wildflowers in a vase. Art is meal served with love. Art is a carefully crafted vintage of wine. Art is a garden tended. Art is dedication and intention. My own love affair with art started at a young age. Like most children, I loved art class and couldn’t get enough of it. My love for art class followed me through high-school darkrooms and ceramics studios and ultimately influenced my decision to study art education at the U of I. With a BFA in hand, I set off to change the world as an art teacher. Finally, my childhood dream was realized; art class all day, every day. Except, I wasn’t making art. Of course, there was the art of teaching, and the creating of art projects with my students. And there was a lot of joy to be found in that. But I found I had been neglecting the very ideals I was working so hard to empower my students with: Make art; find yourself; share it with the world. As an art teacher I had often quoted the infamous Picasso: “Every child is an artist, the problem is how to remain an artist once he grows up.” And yet, there I was. A grown up with a box of dried up oil paints. Art began to feel like a distant relative. A second cousin twice removed. I wondered if my artistic abilities and passions had faded with time. Like a foreign language once mastered, would art come back to me if I began to speak again? Would I stumble over simple phrases? Would the pen flow freely? I feel as though I might not be alone in this fear. Even if you don’t consider yourself an artist, there may be a form of art in some aspect of your life you have put aside for a time; Those running shoes sitting undisturbed in your closet, a dusty cello case in the attic, a patient sewing machine in the basement, or beautiful words quietly tucked away inside a box of journals. For some reason we’ve stopped doing those things that made us feel alive and free. When did we cease trying? It’s been so long that even though we remember the glorious feel of our feet crushing against gravel, we resist the act of putting on the running shoes. What if I lose my breath? What if I look stupid? What if I fail? So you lace up. You step outside. And you start moving. You might get a side cramp in the third block. You could pop a string or bend a bow. You may break a needle or two. You might hear crickets when you share your story. 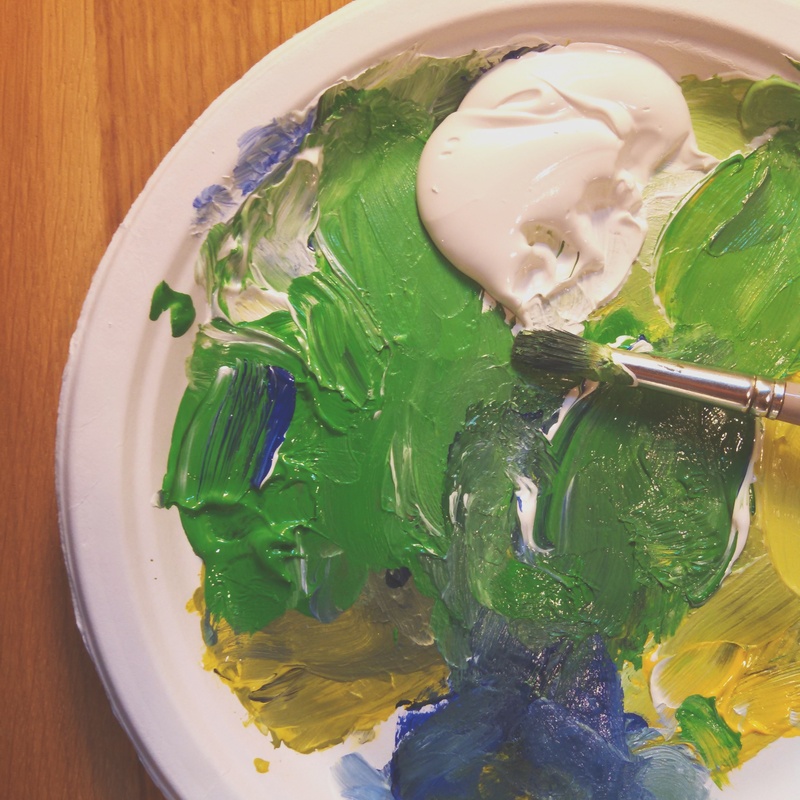 You might even make a crappy painting (or two), and cry into a glass of wine (or two). And even if you do falter, (which is the nature of humanity) you have planted a seed. And if you water that seed, it will grow. Art will grow into something uniquely beautiful that you never would have known had it been left un-nurtured. That is the art of art. This past year I’ve been learning how to nurture art back into my life. Slowly, I’m remembering how to capture an impression in time on the pages of an essay, the wonder of nature in a photograph, or a feeling of vibrancy in a watercolor painting. For me, making art again is like coming back to an old friend. It’s familiar and different all at once. But most of all it’s just good. As you awake and begin anew. A quiet plea to slow the rush – to stop. To turn inward, searching every part. Miles of grace-full, endless white. A chance to carve new paths. Daughter, Sister, Friend and Mother. Remember; Tomorrow too, is new. That line gets you every time. That single, pink line – almost mocking you. 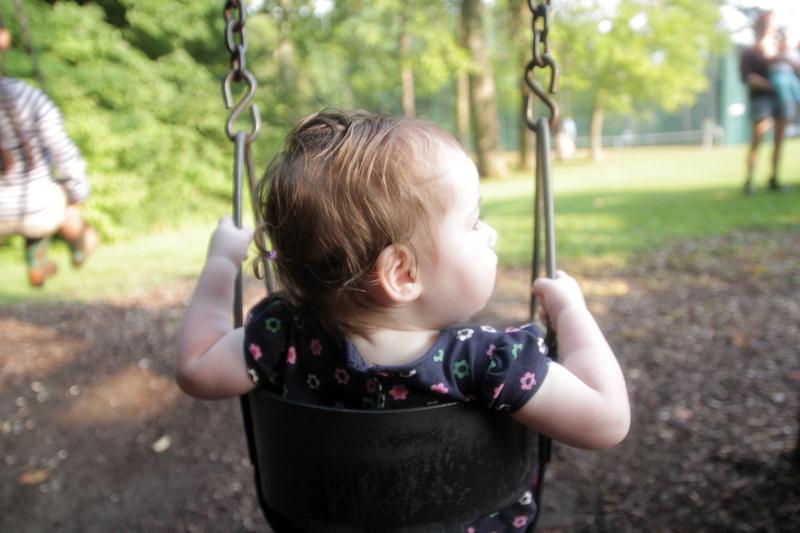 A feeling of helplessness washes over you; Why did you even think you were pregnant? Why did you waste a test? A thin, pink line timidly takes up residence next to her confident sister. And you stare in disbelief. You try not to get too excited or too scared. How can a second little line have the power to declare something so life-changing? And so you tell your husband and your family, and maybe even a few close friends, because you cannot contain this new truth. You begin to come to terms with it – all the while pushing back a nagging doubt that you can’t trust a thin, pink line; that maybe you had imagined it; that maybe it won’t last. But you are not going to live in fear, you decide. circling the toilet bowl; streaming towards the shower drain. And then the fear grips you like a rock. You lie paralyzed in bed, praying that if you hold still enough and clench your legs together, the bleeding will stop. And a new truth begins to set in. For imagining life with a new baby. For wrapping up the test to surprise your husband. For buying a big sister shirt for your daughter. For putting your faith in that faint, pink line. But you must tell your husband and your family. So you try to put on a brave face because you don’t want to ruin the family vacation. And you hope your daughter forgets that you told her a baby was in your belly – because how do you explain that to a one and a half year old? And you go to the beach even though your mom suggests you should stay back and rest. You put your feet in the January ocean and you invite the bitter cold. When your toes become numb you walk in a little further. When you can’t feel your ankles you step further still. You imagine walking out till your waist is covered and then your shoulders and your face. But you don’t want your husband to think you’re crazy. So you stay right there and try to keep your balance as the waves crash onto you and then pull back from you with equal force. Like the thrill of new life. Like the sucking gravity of loss. Like your own cycle of grief: in and out; in and out. And for a moment you have a spiritual experience and imagine each wave is cleansing and healing. It seems silly but it helps you feel close to God and find an ounce of peace. On the flight home you think you see a rainbow in the dense clouds and wonder if that’s God, too. Was it was just a fluke? Maybe there wasn’t even a baby. And when you are finally home you feel foolish for being sentimental and keeping that pregnancy test. 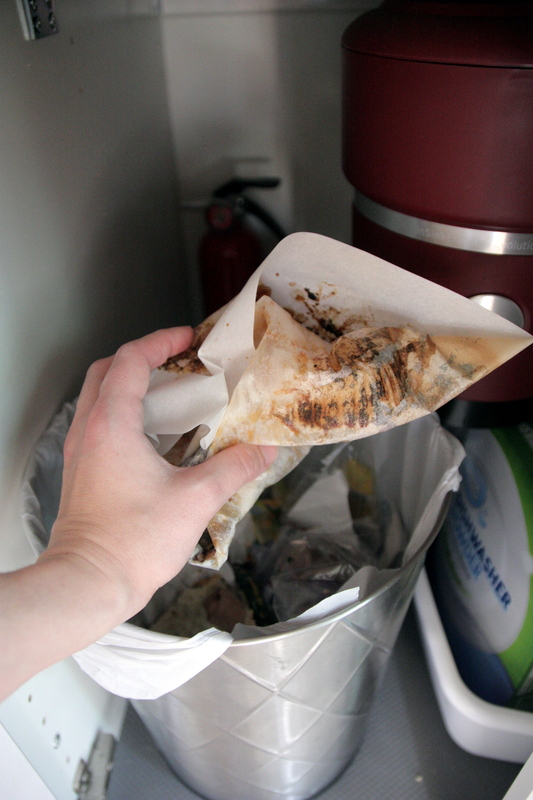 Your sweet, protective husband tries to throw it away before you see it – just like he hid the big sister shirt. You pretend not to see it, but you have to make sure that second, pink line was really there. And when I say you, I mean me. Because this happened to me. But I say you because it’s comforting to imagine that I’m not alone in this. Thank you, Micah for holding my hand through this; for grocery shopping, making dinner and changing diapers when I can’t get off the couch. Thank you to our family for providing us with extra hugs and prayers during our vacation – and calls, texts and emails from afar. 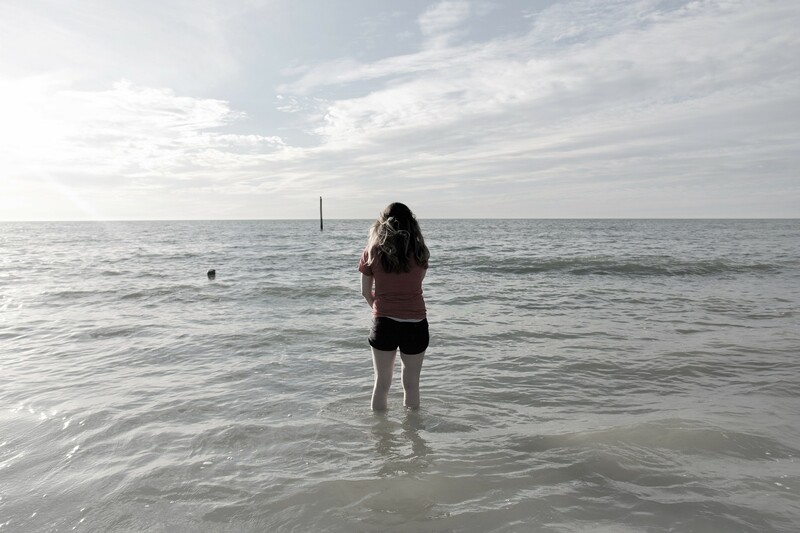 And thank you to my sister, Victoria for taking this photo when I was having a moment in the ocean, which inspired me to sit down and write about it. promising the swift fall of darkness. making way for azure sky. a panic rising in my chest. inviting the wavering light to kiss my face. lulling nature to sleep beneath a blanket of snow. as the days grow short. in the quiet, cold nights. All the while, dreaming of eternal summer. as the deep warmth of wine fills my belly. I hold out through the dusk, through the night. I will return with the light. 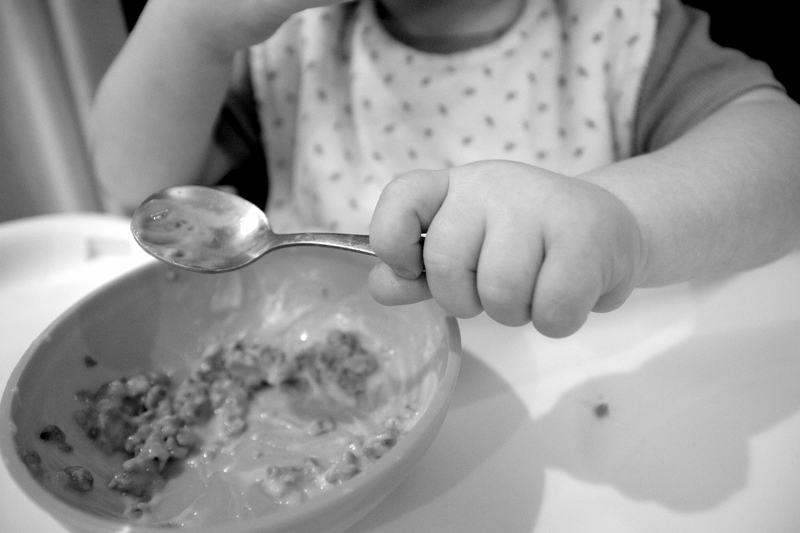 As I sit at the kitchen table on a rainy, Thursday morning – watching Helena attempt to master the spoon from her high chair – I feel incredibly blessed to be here, sipping my coffee as I slowly wake up. The reality of this blessing is not lost on me. I know that many of us are off to the mines before our loved ones come out from under covers. 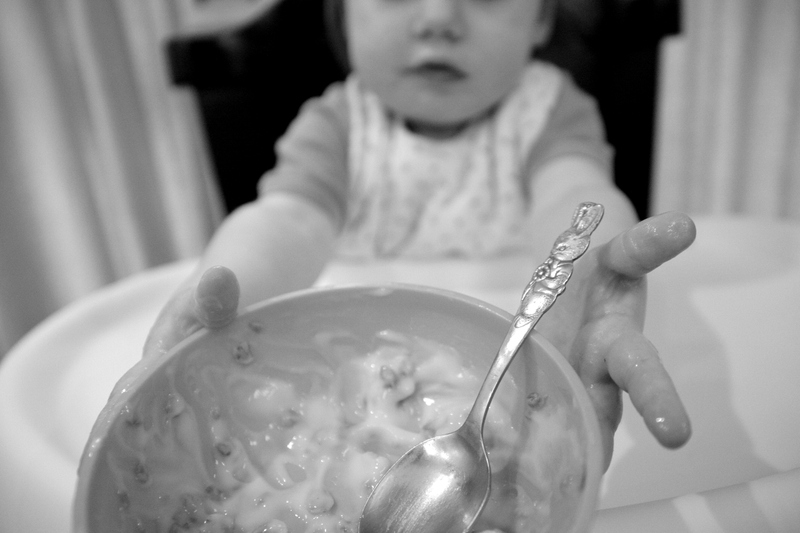 Or that a shared breakfast might consist of granola bars on the way to the car. Our morning alarms are akin to the starting shot of a race. Every day there’s a mad dash to see how quickly you can take a shower/get dressed/do your hair/do your makeup/eat breakfast/feed your family/pack lunches/pack your bags/load up the car/try not so speed. After doing some soul searching and re-prioritizing I sprung for a change this school year. I resigned from my full time position teaching art in order to take a part-time teaching job that would give me the flexibility to spend the mornings at home with my daughter. From the working-mom perspective I have to keep reminding myself that I’m not the art teacher any more and I don’t have to keep taking on all the responsibilities I did when I was getting paid to be the art teacher. There are plenty of capable teachers at our school, and I don’t have to volunteer for every creative endeavor that comes along. So while a part time job isn’t quite as glamorous as I’d imagined, I feel so grateful for the peace that accompanies our mornings now. I’m doing my best to cherish the extra snuggles and the leisurely breakfasts because like all things in life, this is just a season. I do not know what is in store for our family next year. My new position is not guaranteed, and I have not reached tenure in my school district. All this uncertainty is enough to snuff out my new-found sense of calm if I allow it. There will always be bills – there will not always be babies. So I sip my coffee from a kitchen mug – not a travel mug, not a Starbucks cup – on this rainy, fall morning, and I do my very best to embrace this gift – this season of simplicity. In the middle of this saintly purse there lay a Coach wallet & two smooth, black leather glasses cases. Tucked in the two left pockets I saw the golden glimmer from the top of her iPhone, and three identical silver tubes of lipstick, lined up like bullets in a clip. 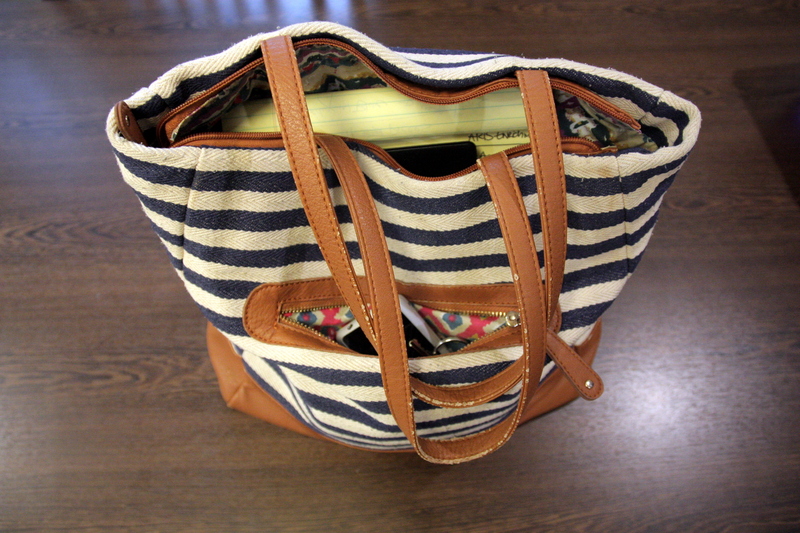 The only sign of life in this perfect purse was a slip of paper – haphazardly folded in the right hand pocket. I quickly counted. Eight. 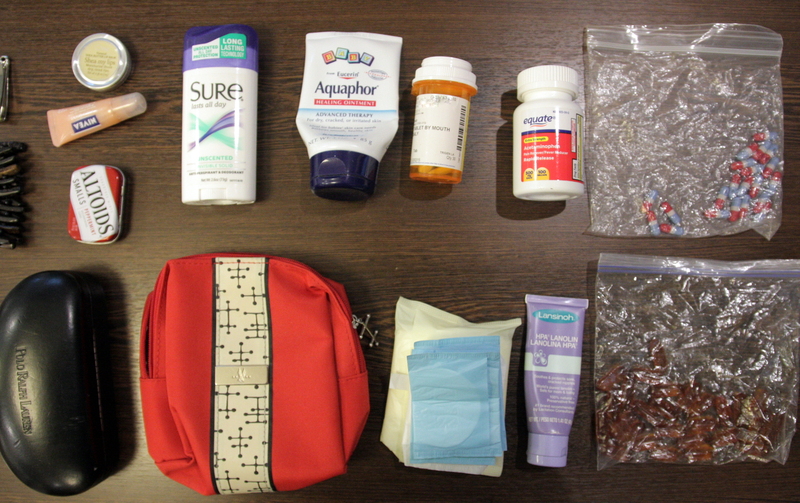 Eight items in this woman’s bag. I feel like someone somewhere has said that how you keep your purse is a reflection of how you live your life/what kind of person you are. Or maybe it was how you keep your home… Either one is probably true. With new-found resolve, I set aside some time after work the next day to assess my purse situation. …but I didn’t realize it was going to be this cringe-worthy. Continue reading only if you wish to see the airing of my dirty laundry. Literally. 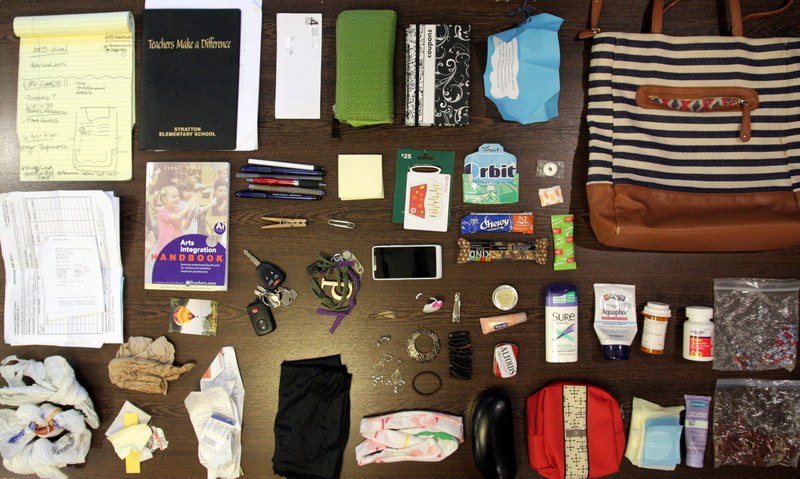 I had no idea how much junk had accumulated deep in the bowels of my purse. As I began to sort through all the contents of my bag, I quickly regretted my decision to document the “simplification of my stuff”. A lot of it was ridiculous. Some of it was downright embarrassing. However, I pressed on. I felt like this was some kind of atonement for sneaking a peek into a stranger’s purse during church. In case you couldn’t make sense of that pile, here it is – all laid out for your viewing pleasure. 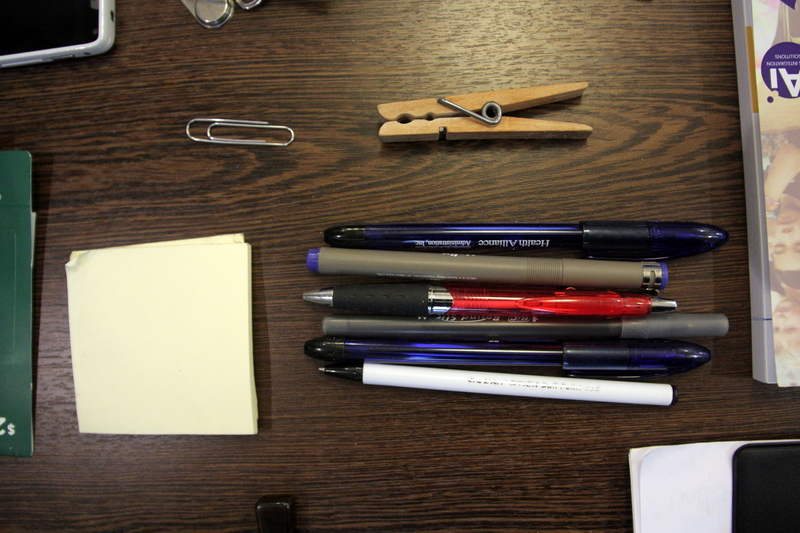 As it turns out, I found it very therapeutic to sort through and organize what I had been carrying around with me (most of it needlessly) for the past several months. 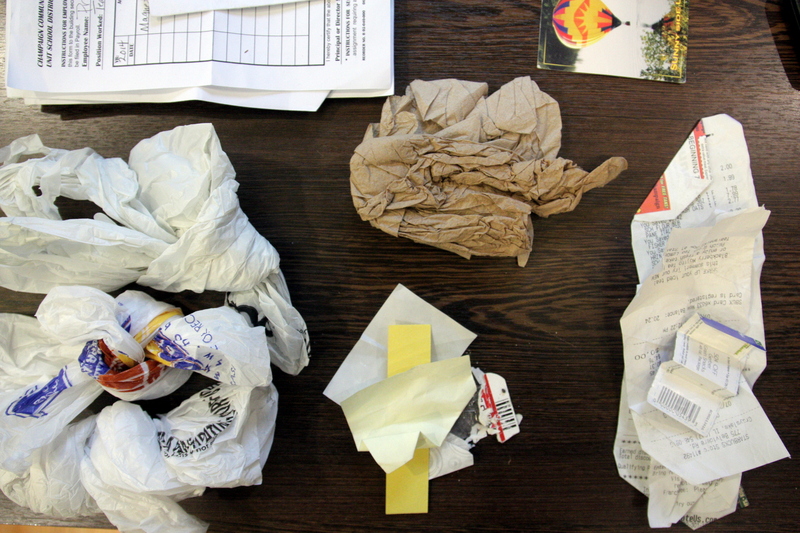 The last time I had a good purse cleaning was when I made my seasonal bag switch-over last spring, which basically meant I pulled out old napkins & receipts, dumped everything else into a different purse and called it good. Let’s zoom in a little, shall we? Here, we have the personal hygiene/care category. There are a few items here that every lady likes to have on hand… especially a loose baggy of generic tylenol – with an extra bottle-full, just in case. I also like how I still have lanolin and soy lecithin supplements (the other baggie) back from the days of breast-feeding battles. As we pan to the left, we enter the fashion accessory aisle. 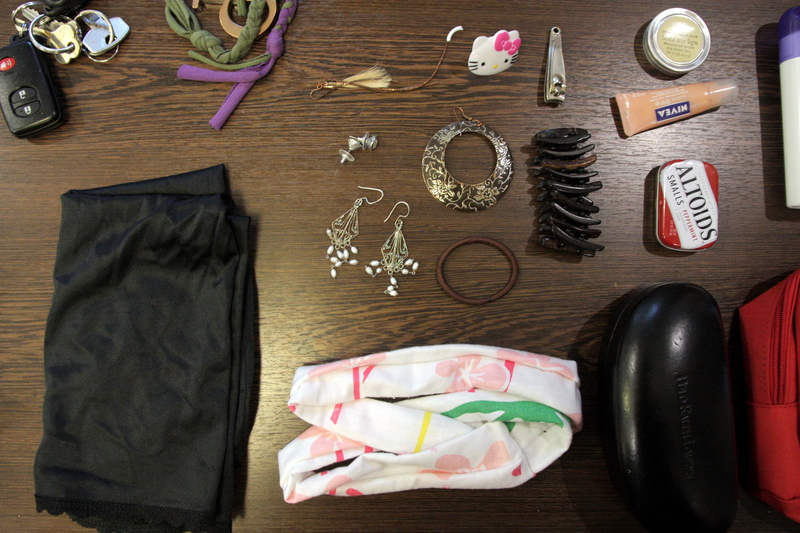 I spy hairbands, a bracelet, and two & 2 1/2 pairs of earrings. Also, a broken plastic hello kitty ring. Why…? And then, there is the aforementioned laundry… That black silky rectangle is a slip. A couple weeks ago while wearing this slip at work, the elastic band became unbearably tight after lunch. So I made a judgement call and ditched it. I stuffed it into my purse and it made it’s way down into the abyss to be forgotten until now. 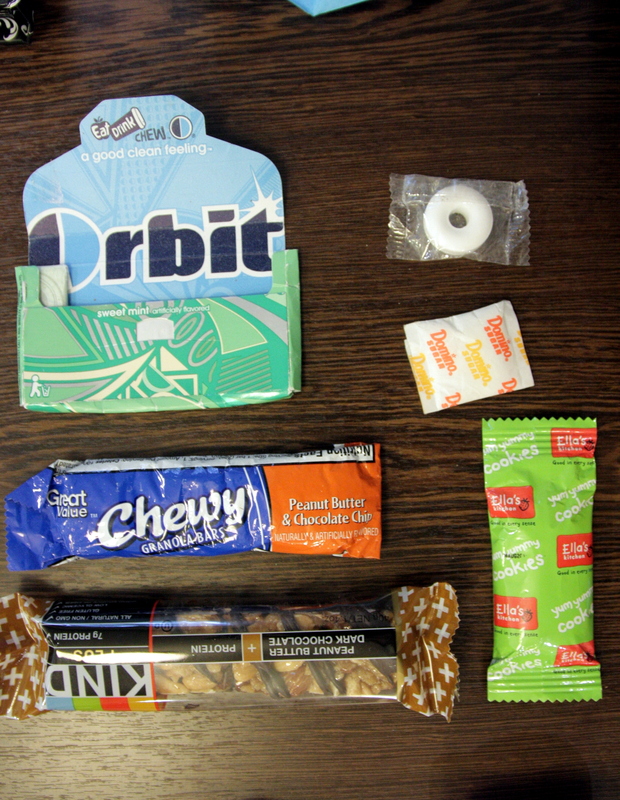 There is also a peculiar stash of snacks…including a sugar packet. 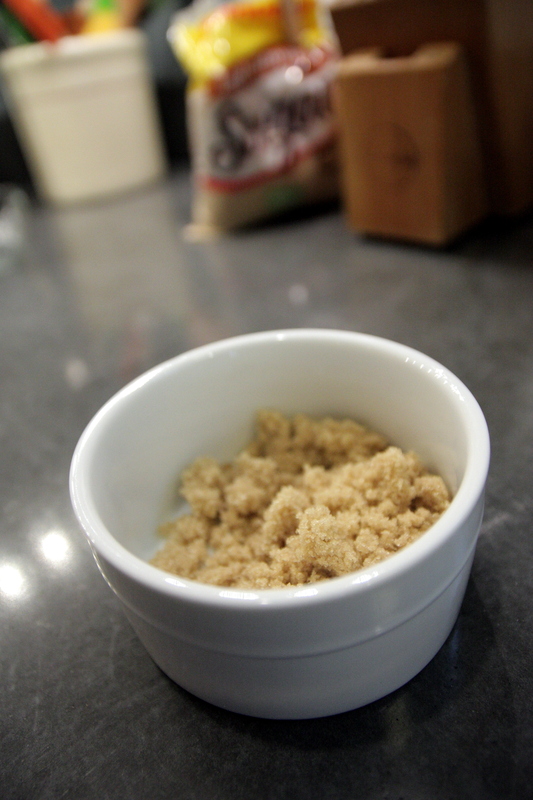 You never know when you’ll find yourself with a cup of coffee in the middle of a sugar desert. I tried to do a quick count of all the items piled on the kitchen table, but I lost track somewhere in the 40’s and was too discouraged to start over. But I think you get the idea. I had a ridiculous amount of stuff in my bag. After visually organizing everything into categories and subcategories, I began to throw away the garbage and return things to their rightful place in my home. Medicine to the cabinet, pens to the drawer, slips to the laundry basket, etc. – Do I use it everyday? – Do I need to carry it with me? 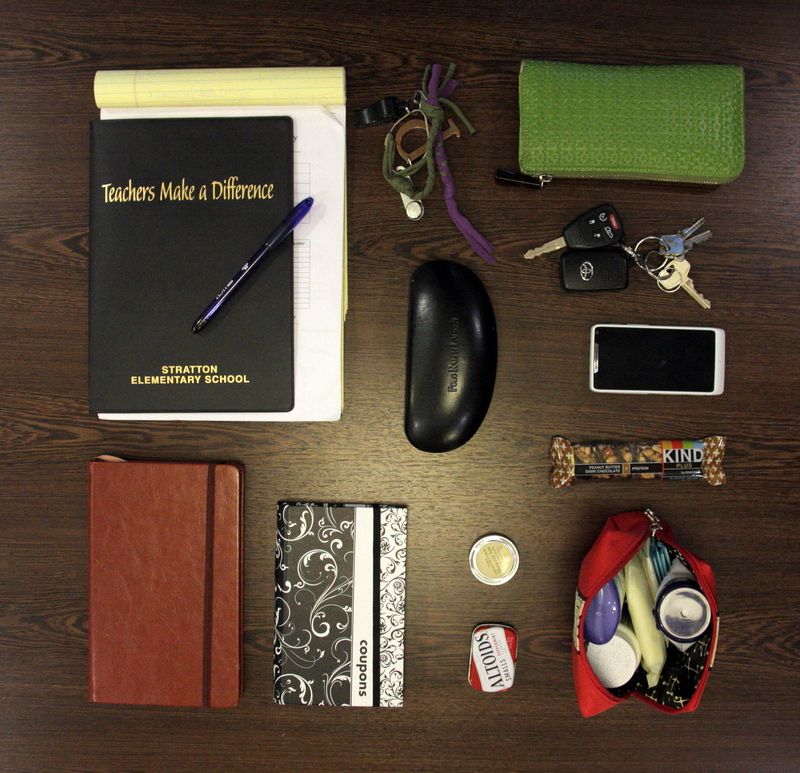 I kept all the obvious things – like my keys, wallet & phone. Most other things are debatable and could eventually be whittled down. I recycled most of the school papers in my bag, but kept some important ones tucked in my planner. Other finalists were my sketchbook/journal, sunglasses, emergency snack (very important), mints, lip gloss & a small personal care kit. The last step was the most satisfying. 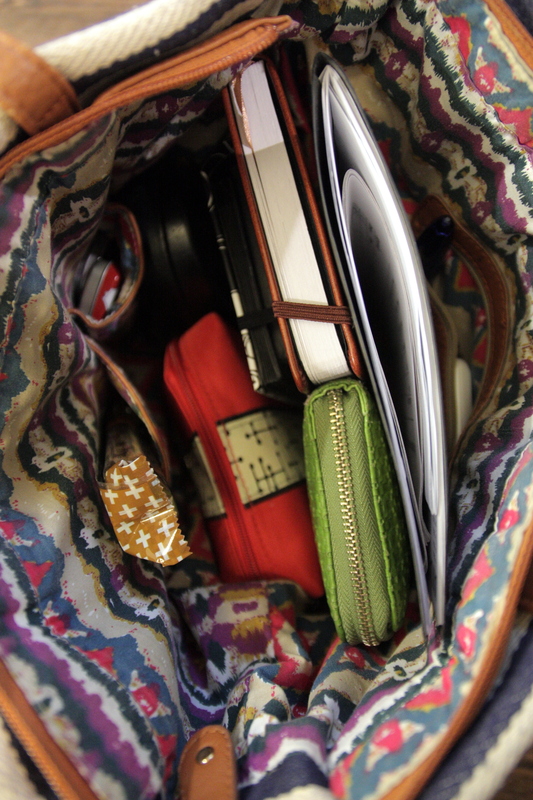 I made a conscious effort to find a place for everything I put back in my purse. 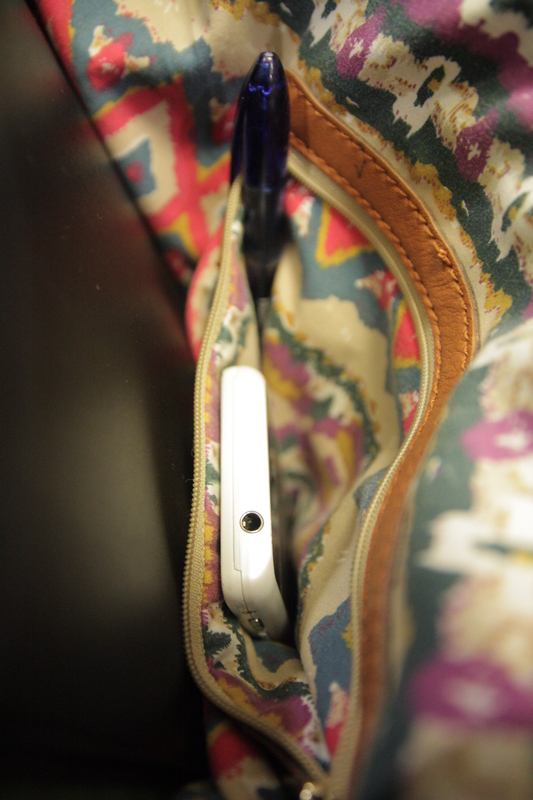 I found a spot just for my phone and one pen! 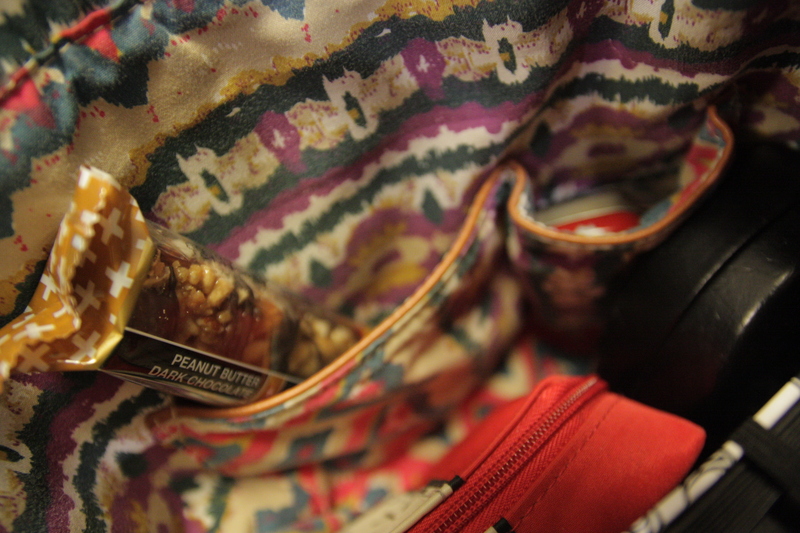 Let’s not forget a place for mints and that very important emergency snack. 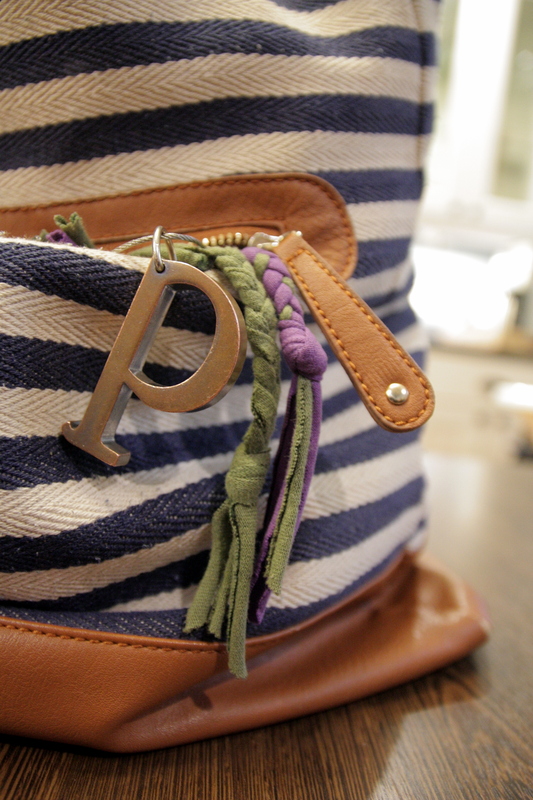 Most importantly I decided once and for all which pocket would hold my keys. No more wading through napkins and earrings to get the car started. Front and center, baby. 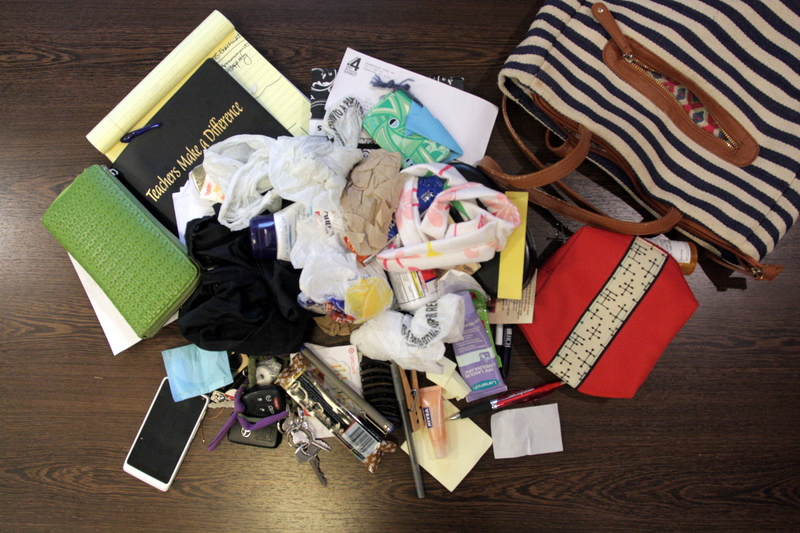 And that, my friends is the saga of the girl with the embarrassing amount of stuff in her purse, who saw the contents of an enviably simple purse – and decided to get her act together. Some of you may be re-thinking our friendship right now. Totally don’t blame you. Maybe some of you just got your Hoarders fix for the week & now you feel a lot better about yourself. I also don’t blame you for that. But maybe some of you can relate. Maybe you feel a little encouraged that someone else who doesn’t have it all together is taking simple steps towards pulling it together – so maybe you can too. Maybe it’s your purse or your linen closet – or maybe it’s a relationship that needs to be laid all out on the kitchen table. Get rid of the trash. Make room for the good stuff. Whatever it is – get after it. I can’t tell you how much lighter my step is (literally) now that I am not carrying junk around with me every day. I feel a peace of mind having simplified a small part of my life. I’m hoping it catches on, but in the meantime I have to be vigilant. I caught a stray hole puncher floating around in there the other day. Tell me, what are your tried & true methods for keeping stuff at bay? Has anyone else had a recent conversion to simplification? Come on down to the water, my friends. We may not always agree on politics or religion, but I think we can all find common ground where there is bacon to be had. A couple years ago, my domestic goddess of a mother-in-law suggested a new recipe for making bacon. I believe she saw it in a Better Homes magazine. I know, “bacon recipe”? How can you have a recipe for bacon? It’s one ingredient! Place bacon over stove in pan. 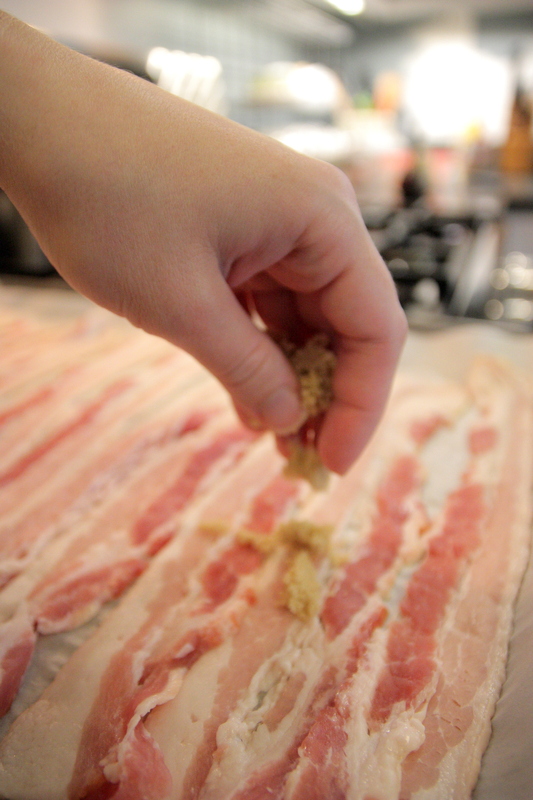 Nevertheless, we tried this newfangled “bacon recipe” and, well – it changed my life. A short time later we were on breakfast duty for my family’s Christmastime reunion and Micah decided to use this recipe. It was a game-changer. Everyone raved about it. Since then, I’ve lost track of the amount of times my sisters have asked Micah to “make his special bacon” at family get-togethers involving brunch (which are most of them). 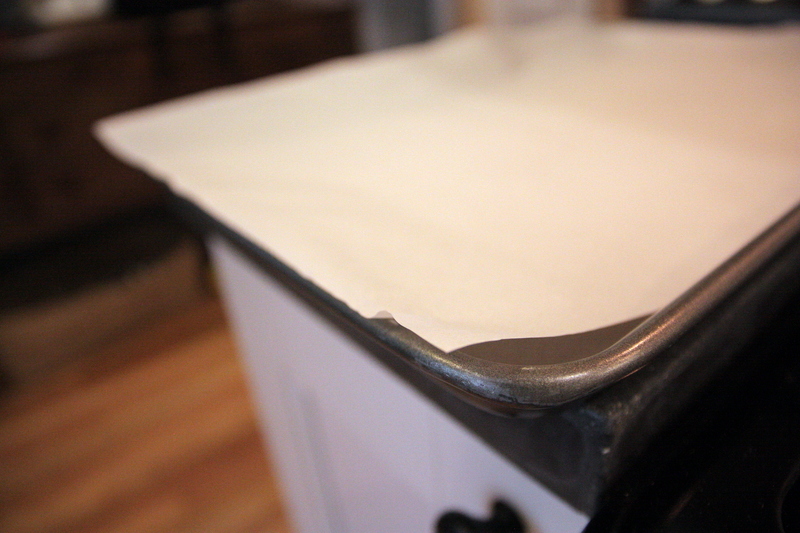 Trim a piece of parchment paper to fit into your pan. You want it to curl up the edges of the pan to catch the bacon grease, but not so high it will catch the broiler flames. Next, open your package of bacon and line those pink piggies up along the pan. 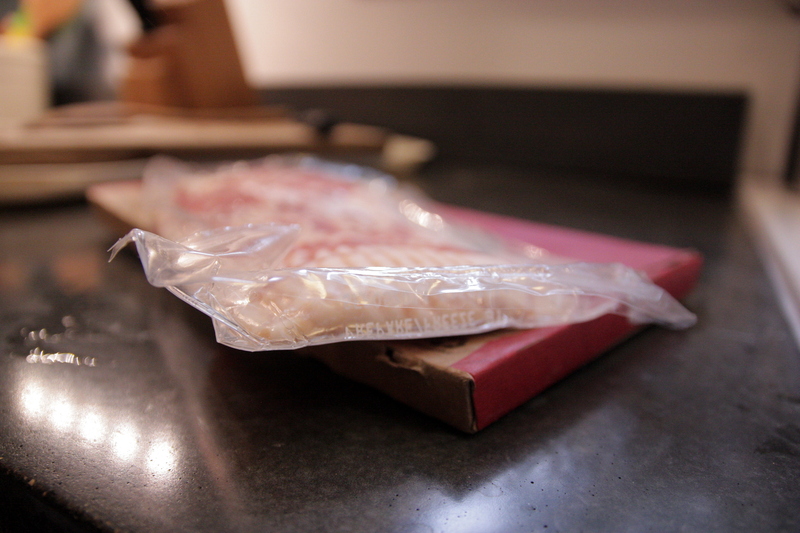 Now that you have your bacon organized, get out your secret ingredient. 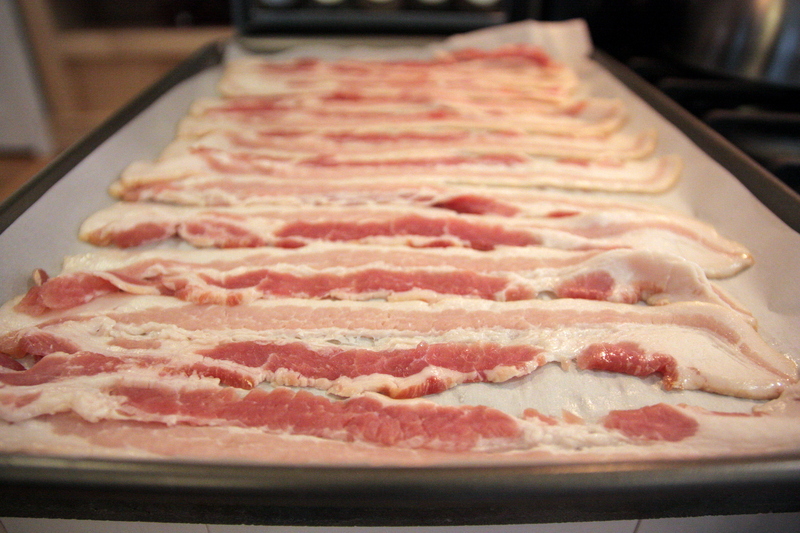 Begin by sprinkling liberally over the entire pan – aiming for the bacon. 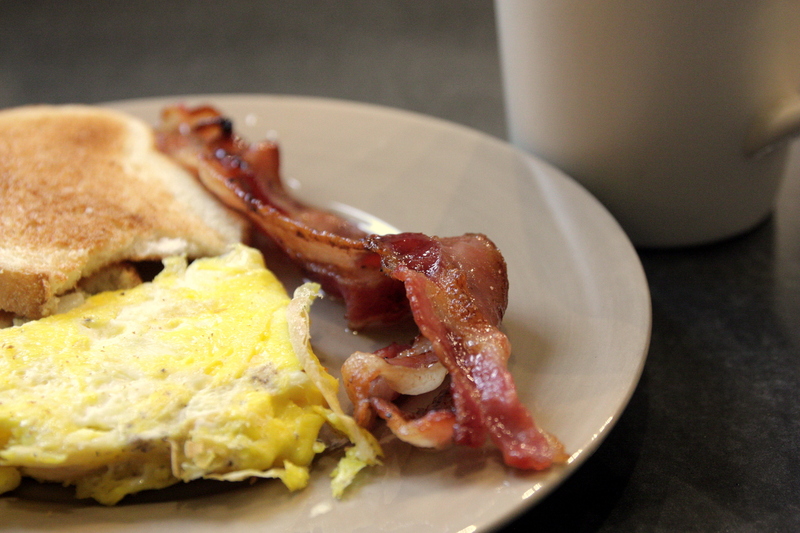 If needed, dump it on for better bacon coverage – aka BBC. 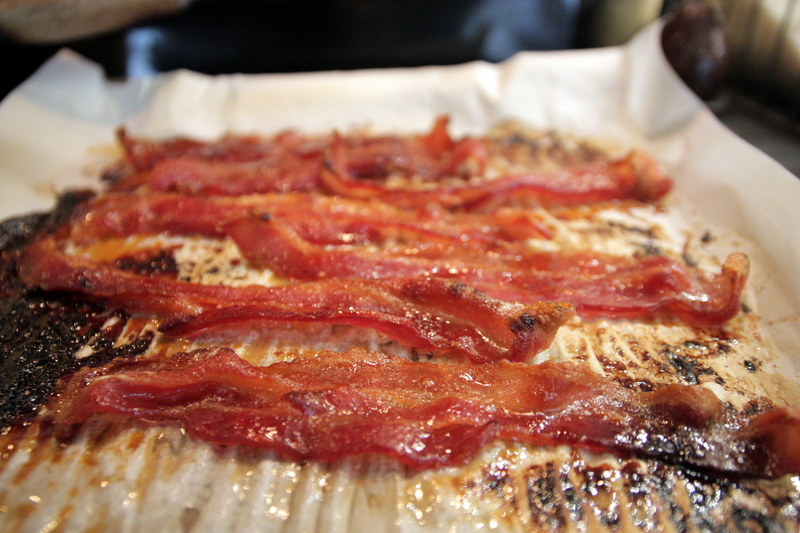 Place bacon in the oven on Low Broil for 10 – 15 minutes. Check periodically for even cooking. You may need to rotate your pan or push some bacon around with tongs. 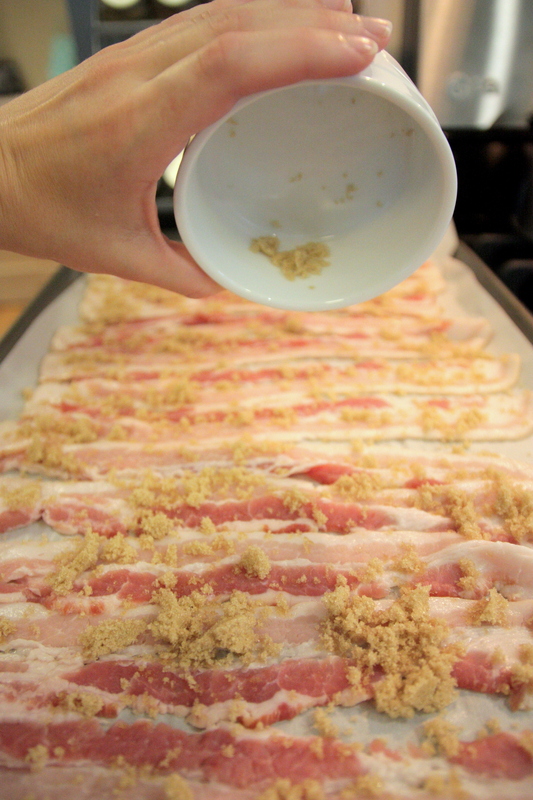 When bacon is crisped to your liking, remove and enjoy your bacon candy! I have never had a bacon doughnut before, but I’d like to think it tastes something like this. 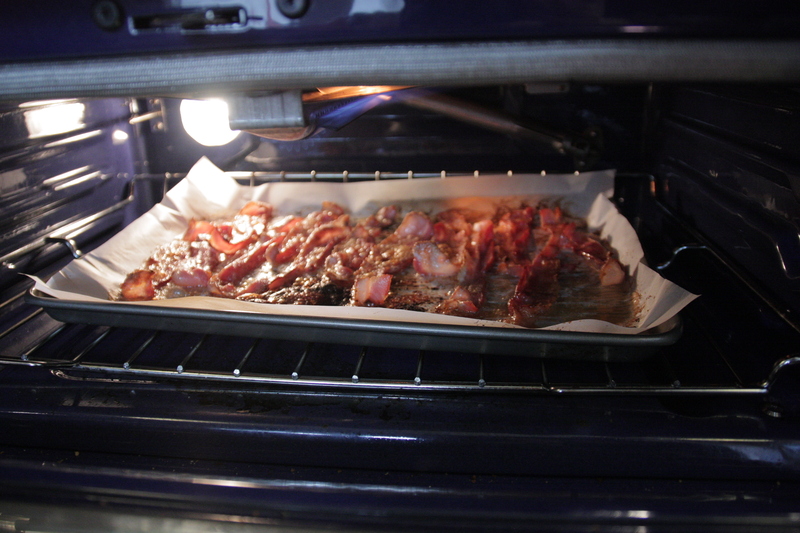 Something magical happens while that bacon is in the oven – I don’t really know how else to describe it. The brown sugar seems to melt into the bacon and creates a delicious, mouthwatering glaze which perfectly complements that salty, greasy strip of goodness. 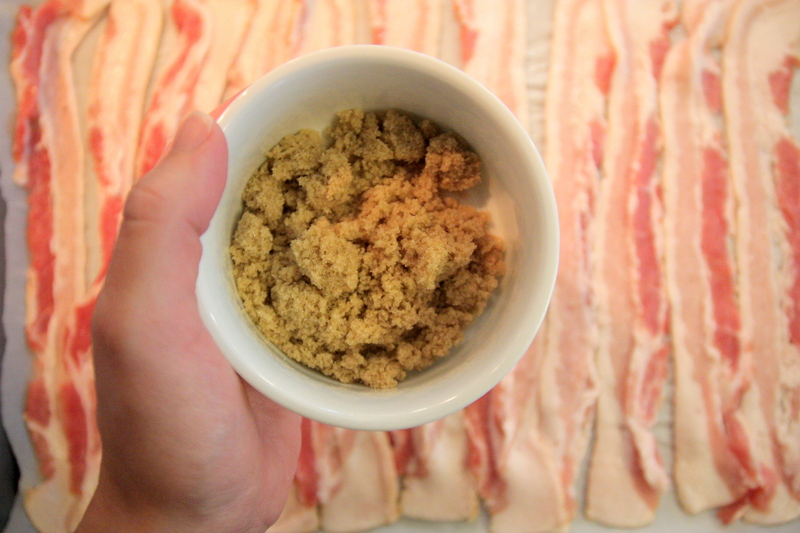 I’m the kind of person who likes a little sweet and a little savory for breakfast, so I feel like I’ve hit the jackpot with this brown sugar bacon. 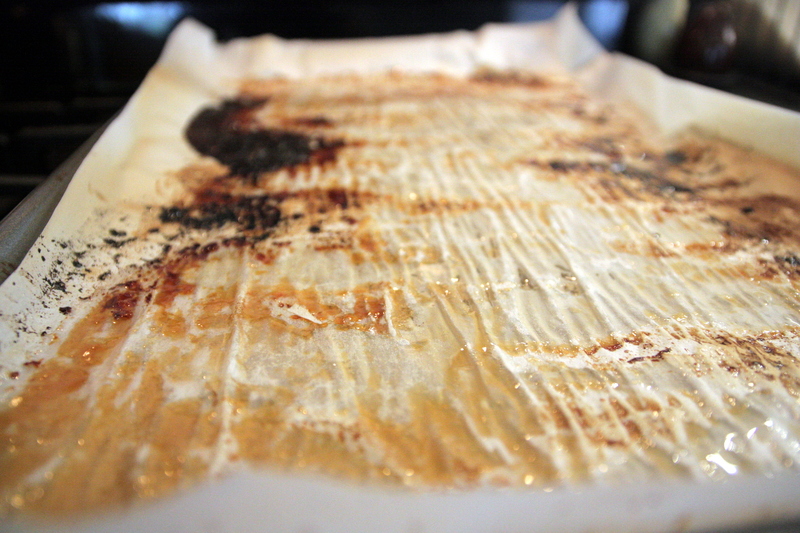 Also, if you’re like me and avoid making “fancy” breakfast because of all the dishes – you’ll be happy to know that the cleanup for this Better Bacon is almost as sweet as the bacon itself. 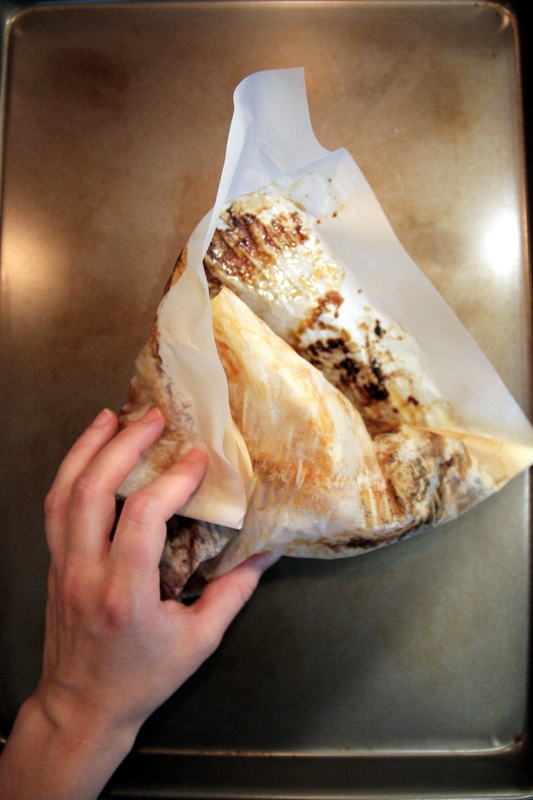 Pretty soon, that bacon grease will start to congeal, and you can lift the parchment paper like so. 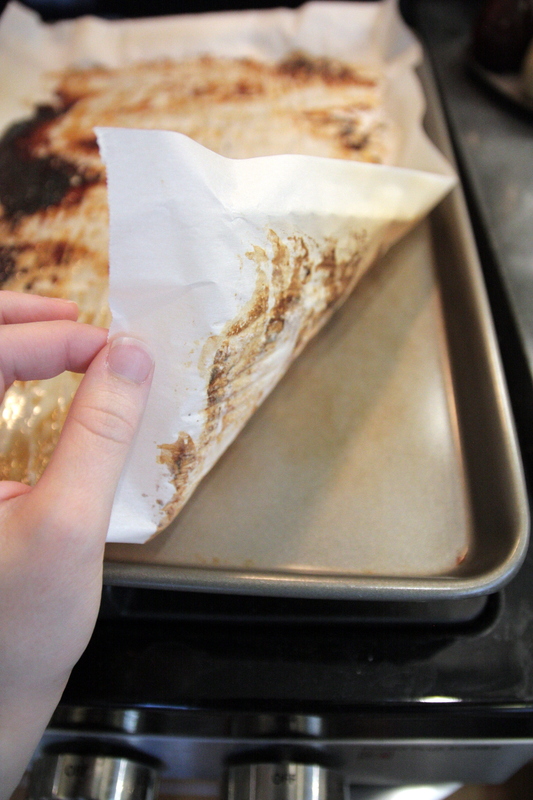 9 times out of 10, your cookie sheet will be clean as a whistle. Or maybe need just a quick rinse. That is 95% better that the mess inside your frying pan after making normal bacon. I don’t know where I got those statistics. But you can trust me on that. And boom – just like that, you’re done. It’s 3:30 a.m. I am up with my daughter for what seems to be the third time tonight. I’ve tried rocking her, nursing her; this time I’m stroking the hair from her face and gently rubbing her back – my own back aching as I arch over the crib to reach her. The minutes pass on as I will her to sleep…I think of my phone laying idle back on my nightstand, wishing for something to pass the time. And then I think of the families I’ve been seeing in the news lately, reading about in countless articles shared by friends. Families in Ferguson, MO. Families in the Middle East. Families in West Africa. The family of our dearest Robin Williams and all those who have lost their loved ones too soon. Families who would give anything to have another moment like this in the quiet of the night with their babies. The world seems to be crumbling all around me & I feel I a little hopeless. I have no answers. Nothing to offer. And so I will pray. That is how I will pass this time with my daughter in the middle of the night. This past week, I’ve been meditating on a prayer. I guess it’s kind of a poem/prayer. 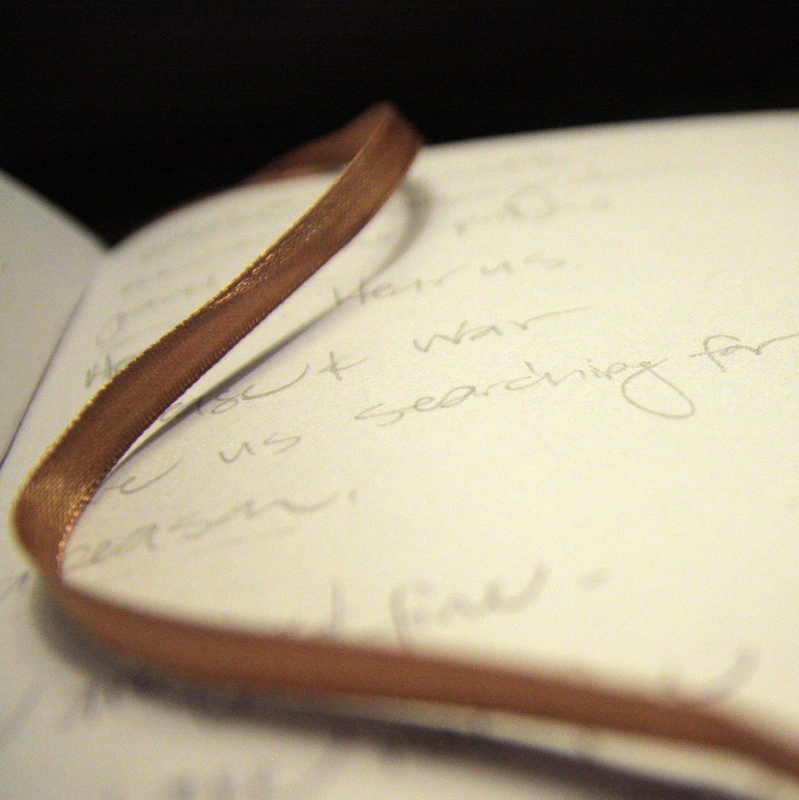 I started writing it down in my journal & have been struggling to share it all week. Partially because I’ve never had the knack for poetry, and partially because a little voice in the back of my head tells me that prayers are to be private. I was raised to believe that prayer wasn’t something you did loudly in the streets – it was something you did at home in a corner. (I think this is based on a parable – someone help me out here…) But my heart has been heavy this week. I see so much negativity and dissension on the internet – especially amongst Christians – acting as if we can fix everything by SHOUTING across the internet. So I decided to put this poem/prayer out there. I don’t want to add to the noise – I just want you to join me, in prayer. So here is my prayer, from my little corner of the internet, to yours. then we’re grasping for a life-line. Show us a new way out. 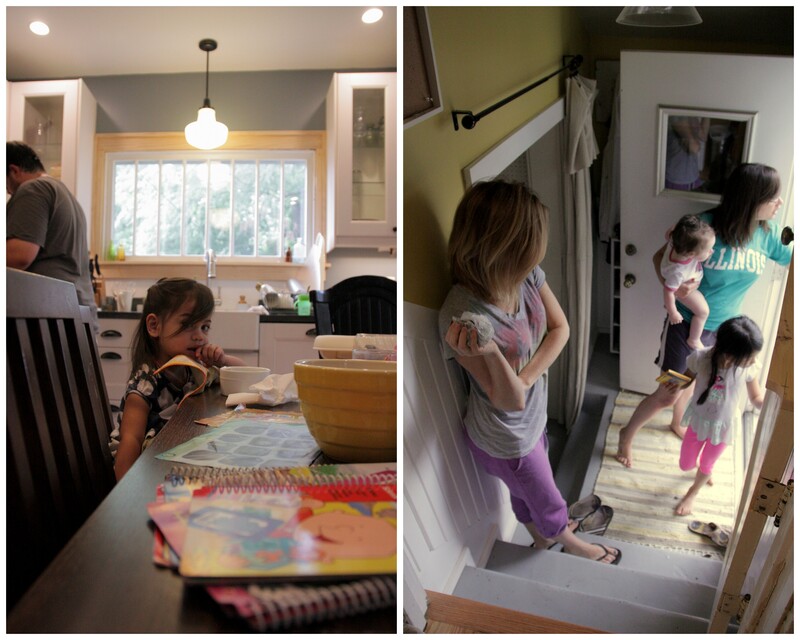 The earthy smell of coffee, sounds of familial laughter and breakfast dishes in the sink carried up the stairway to my room. I fought back the urge to follow the warmth that called to me from the first floor so I could finish the task at hand. Stacks of laundry checkered the bed as I folded outfits for myself and Helena, doing my best to fit the piles into our family duffle. 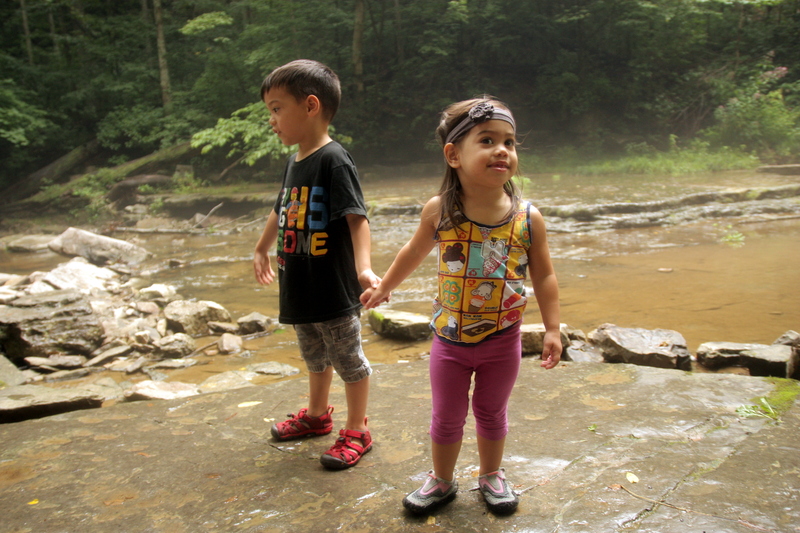 Over breakfast, my siblings and I had reminisced about our history of family vacations to McCormick’s Creek as we prepared to return to our old stomping grounds. We so looked forward to that place because we got to break free and run wild so to speak. There was no structure – no school, no church – although we still sang hymns around the campfire on Sunday morning (s’mores can substitute for communion, right?) and Dad still drilled us on our times tables – but we were free! When we got dirty and sweaty from hiking, we went to the pool. When our bodies grew weary from swimming and eyes stung from chlorine, we flopped onto our bunk beds and took a nap. When we had replenished energy, we took off on our bikes and roller-blades to conquer the winding asphalt roads. 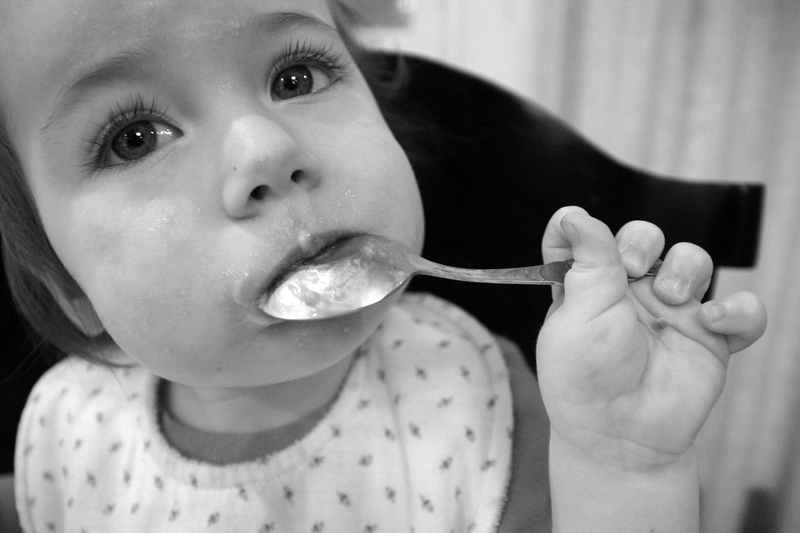 “I remember the sound of the gravel…” said Hannah, as we sat around the kitchen table. “Yes!” we all said in unison – because we too, could still hear it. Our cabin site had a long, gravel driveway that branched off the state park road. After we had set up camp we anxiously awaited to hear the sound of the gravel crunching beneath tires. “They’re here!” someone would shout and we would come running from all corners. Sticks were dropped, books shoved under pillows, and screen doors slammed as we raced to see who had arrived. It might be a family that my parents had invited to join us, or our grandparents whom we hadn’t seen all year. 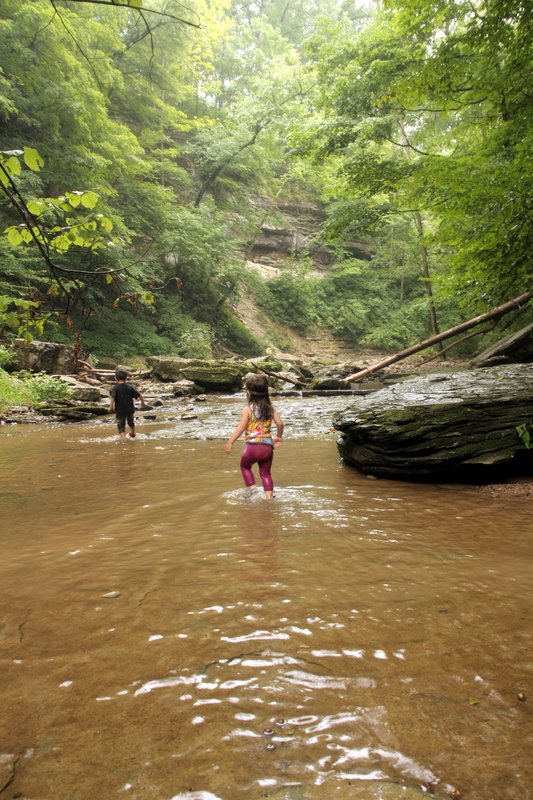 As a child, hanging out with our Grandparents for a week at McCormick’s Creek meant a steady supply of Wrigley’s Double Mint Gum and Werther’s Original Candies. It also meant they might buy you a new swimsuit at the nearest Walmart or teach you how to play games with dice and cards (which were normally banned from our conservative household because of their ties to gambling). Somewhere along the line, kids went off to college and our tradition tapered off. We no longer vacationed as a family every summer. Nine years ago, my siblings planned a return visit with some childhood friends for a weekend of tent camping (or real camping as my husband would say). The cabins had long since been torn down (they were always a little worse for wear – which is probably why we could afford to vacation there as a family of 11) but we visited the site anyway as if it were hallowed ground. During that trip Tabitha’s boyfriend at the time planned a proposal during a hike which I captured with my (very amateur) photography skills. Naturally, that place became even more special to our family. 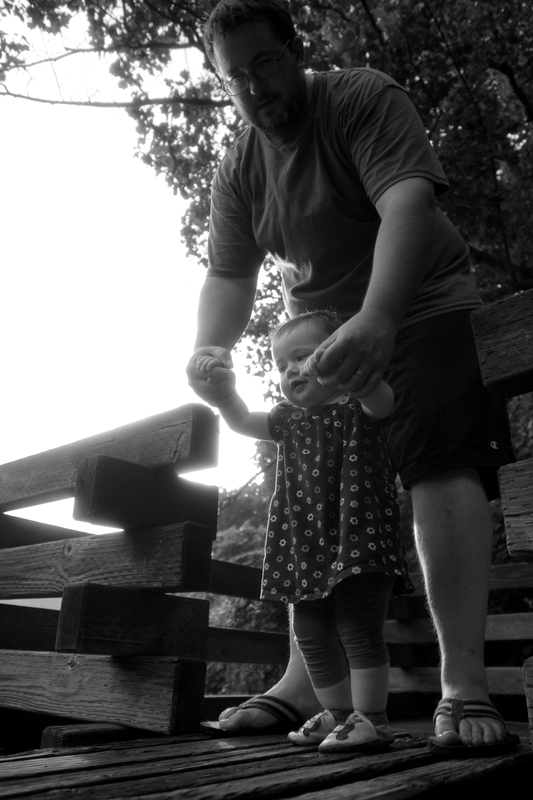 Fast forward a few days and we are back home – there are extra piles of laundry in the basement and camping supplies waiting to be stowed away – but I wanted to sit down and write about this place and these memories before the summer is swallowed up and they are forgotten. And no family vacation would be complete without a little drama – or debate as some might call it – but nothing that a little passing of the wine bottle around the fireside can’t cure (getting a little more accurate with our campfire communion here). 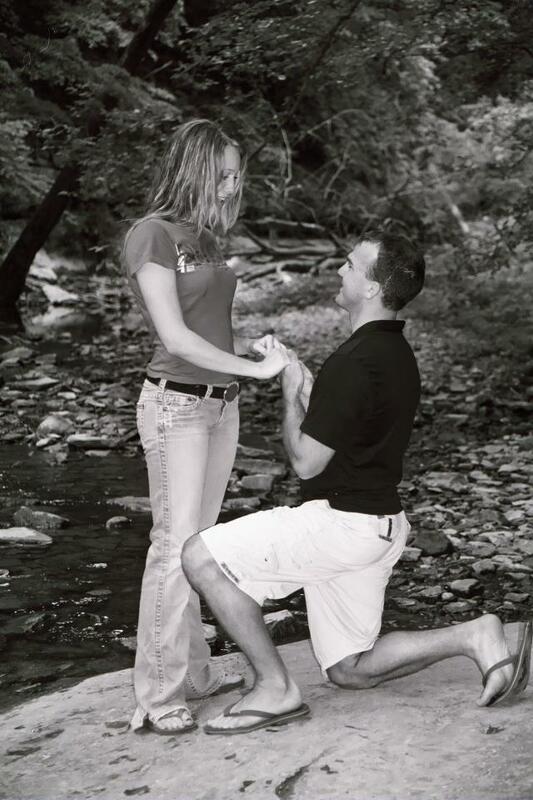 We were all a little bummed, too for Tabitha & Adam when they hiked around for hours – looking for their original proposal site and couldn’t seem to find it. 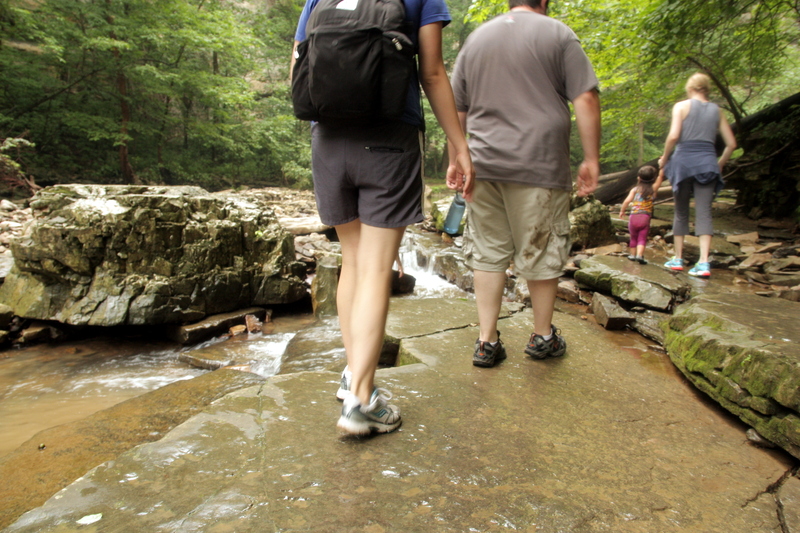 But, they experienced a new adventure together and burned several hundred calories. 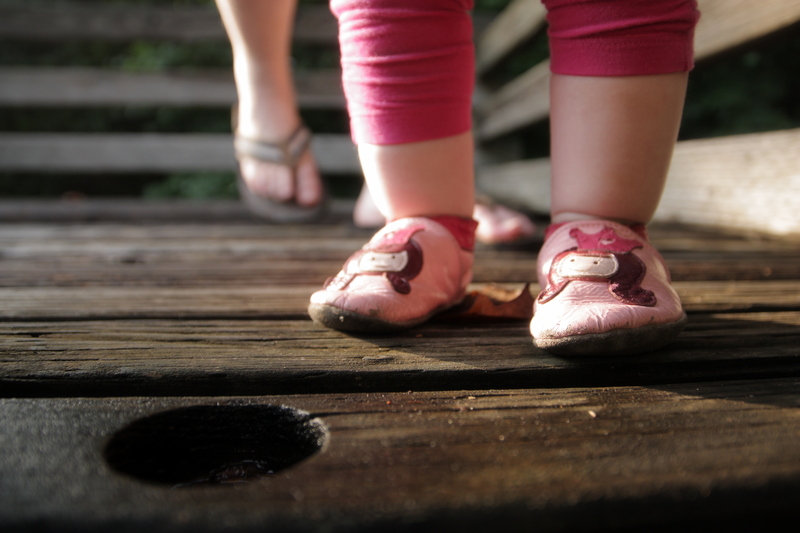 Revisiting this place as a mother also had me re-adjusting my expectations a bit as I spent what seemed like hours cooped up in our cabin – coaxing my daughter to sleep each night- when what I really wanted to do was join the laughter that echoed from the campfire. But thankfully I have a husband who knows what I need and took the second shift so I could roast a ‘mallow with my siblings. I think for me there will always be a little bit of a let down when you try to re-create an experience or memory exactly. It won’t ever be the same. That is why memories are so precious – because they are so fleeting. I focused on this a little bit during the trip – because of the little disappointments, and mourning that not everyone could be there – like old times. But nostalgia doesn’t have to be sorrowful. 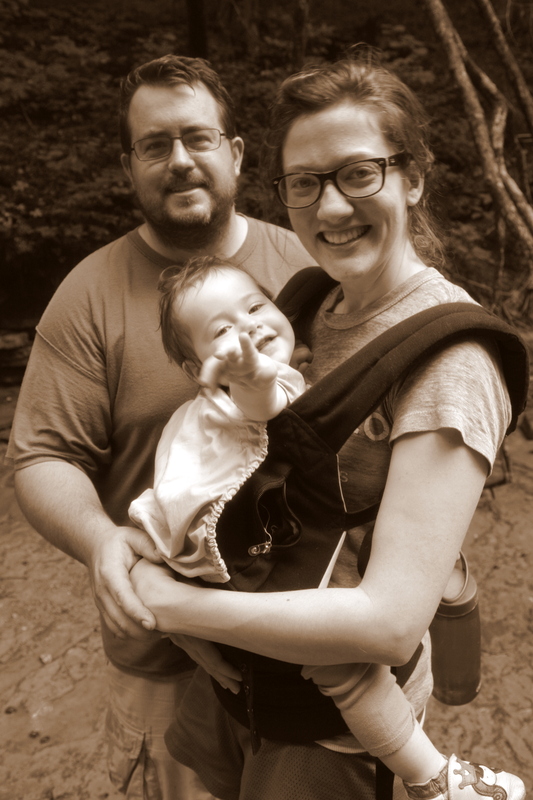 I decided to be thankful, to cherish those memories of my family at McCormick’s Creek – and then to be present and enjoy the new memories that were unfolding before my eyes. 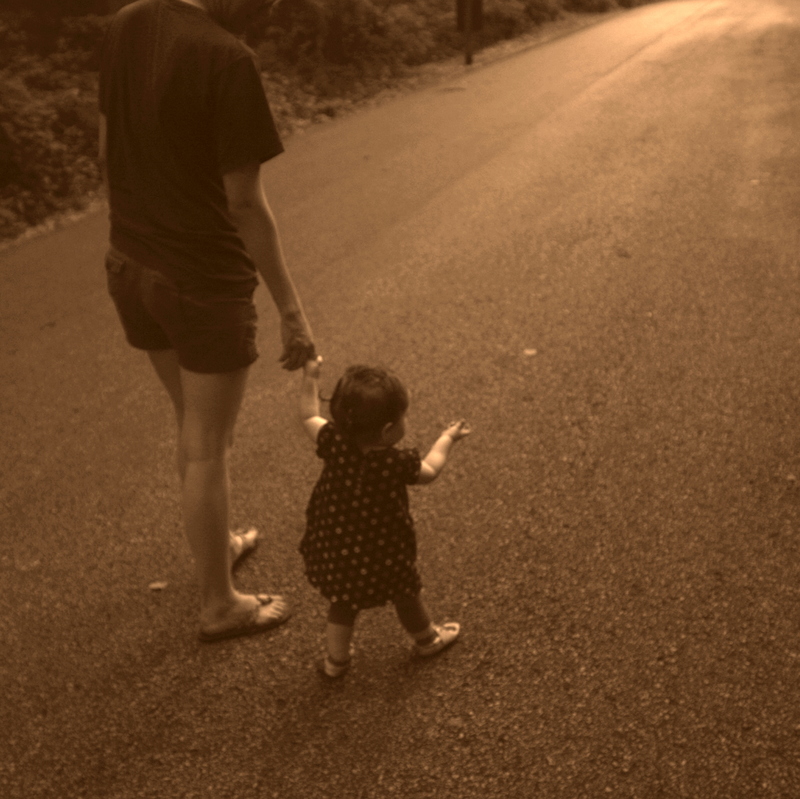 and my daughter started walking! People. 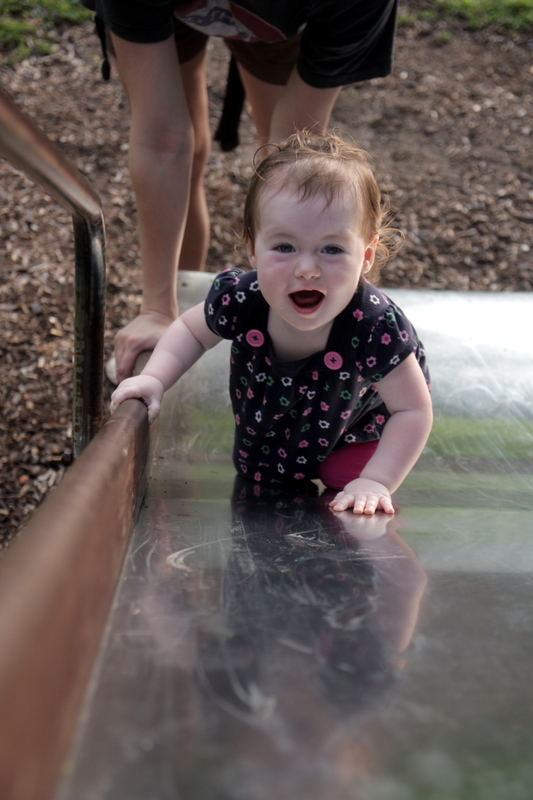 My daughter is a walker. Officially. And I caught it all on tape in a quiet moment outside our cabin at McCormick’s Creek. This may not seem that exciting to some of you, I understand. But wait till you push what seems to be a helpless blob out of your body and then you watch it grow until one day it walks. It will be EPIC. I was so proud of her, and so grateful to have this memory with her, at that place. So, let’s wrap this up with a cheesy (but true) moral-of-the-story. (I am talking to myself here, so feel free to ignore if it doesn’t apply to you.) Cherish those memories. Hold tight to them. But not so tight that you are comparing your memories to your new experiences, or trying to recreate an impossibility. And I don’t mean to sound dismissive. I know for some of us, memories are the only connection we have to people we love. Honor your memories and the people in them by creating new ones. And one last thought. Go camping. 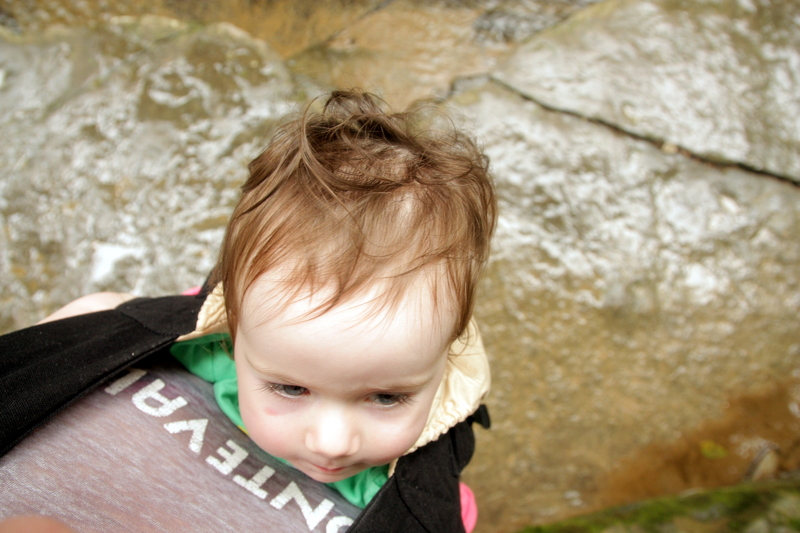 (Who needs Disney World when you can hike through a stream and slip off a rock?) Get off that phone and get some dirt under your fingernails.